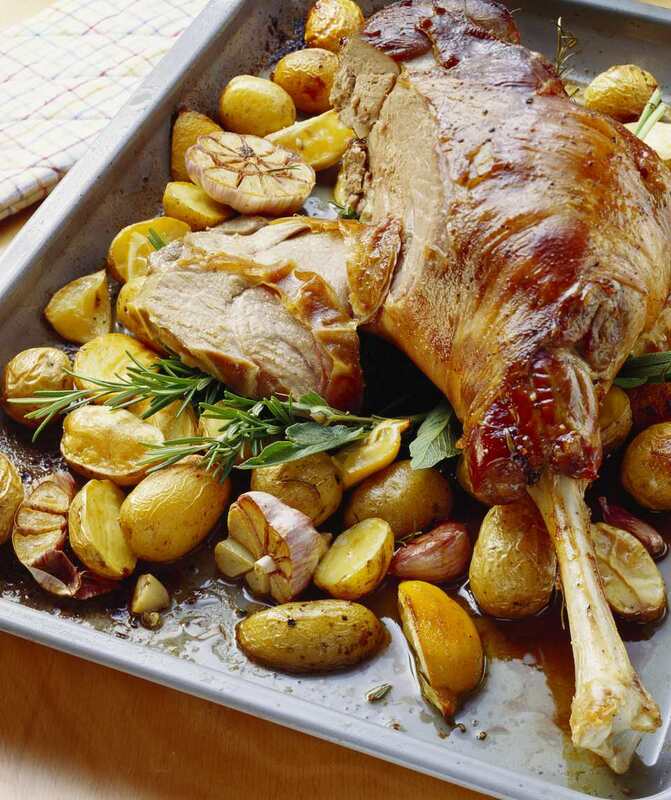 It’s hard to imagine a holiday or feast day without the traditional roast leg of lamb in a Greek household. Accompanied by heaps of delicious oven-roasted potatoes, it’s a classic Greek dish that is beloved by many. When planning how large a leg of lamb to order, you should figure on 1 pound of meat (uncooked) per person. Smaller legs are tastier and yield more tender roasts so opt for two smaller legs rather than an overly large one. Estimate 20 to 25 minutes of roasting time per pound of meat. Marinating the leg of lamb in the refrigerator for at least 1 to 2 hours before roasting yields an excellent flavor. Note: while there are multiple steps to this roast leg of lamb recipe, it is broken down into workable sections to help you better plan for preparation and cooking. Add 3/4 cup olive oil, juice of 2 lemons, garlic, fresh rosemary leaves, 2 tablespoons salt, and 1 teaspoon pepper to a blender or food processor and process until smooth. The marinade should be thick in consistency so it doesn’t run off the meat while cooking and forms a bit of a crust. Place the meat in a large roasting pan. Brush a thick layer of marinade on covering as much meat as possible. Refrigerate until ready to roast. Gather the ingredients and heat the oven to 425F. Add the potatoes to a large bowl. Drizzle with 1/4 cup olive oil and then season with a pinch of salt and pepper. Add the garlic powder, oregano, and dried rosemary and toss the potatoes well to cover. Place the potatoes in the bottom of the roasting pan and make a well in the center. Lay the leg of lamb on top of the potatoes. Roast at 425 F for 20 minutes uncovered. Lower the temperature to 350 F and continue to roast uncovered. Be sure to baste the potatoes and the lamb with pan juices while they are cooking. A 9-pound leg will take approximately 3 hours to cook, but it's best to use a reliable meat thermometer to gauge doneness because ovens tend to vary. Remove the lamb from the oven when a thermometer inserted into the meatiest part of the leg reaches 155 F.
Remove the leg of lamb to a platter, cover, and allow it to rest for at least 15 minutes before slicing. While the lamb is resting, you can increase the heat of the oven to a low broil setting and give the potatoes a little extra color if needed. Otherwise, remove the potatoes to a platter, give them a squeeze of lemon and a sprinkle of salt and then serve with the sliced lamb.